Already our grandparents and parents were making wine, but the current form of our company and the NAHALKO brand and philosophy gained their final appearance about five years ago. Our objective is to keep our ancestors’ love of the grape, care and expertise alive and build our family business on it in a narrow segment of the market full of challenges: in hand made wines and fruit juices, aiming at the highest possible level, the premium segment. The reason was the relatively small size of our lands in the Somló and Villány wine regions and our belief that really good things can be made only if all our hearts and souls are in them. We wish to offer to our customers only what would satisfy us and our children that would benefit our health on the daily basis. We wish to preserve the traditions of the Somló region in our products, its culture, the taste and the values of the unique volcanic soil. 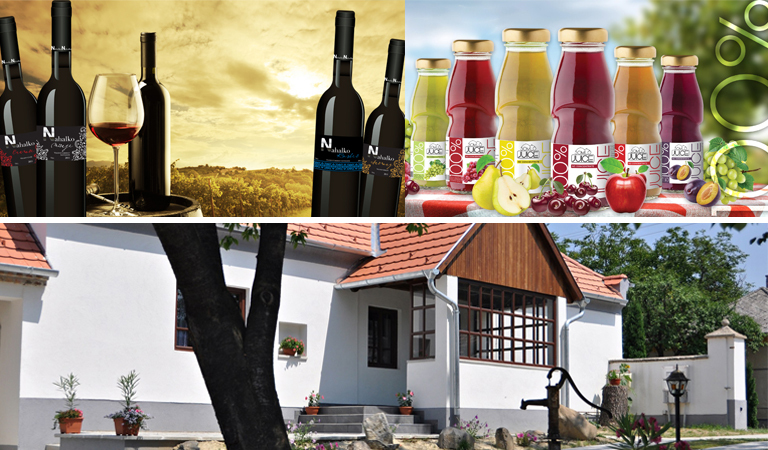 With this in mind, we wish to complement the content of the bottles with the appearance of our natural fruit juices bearing the unique hand drawings after the famous painter of the Somló region, Zsolt Boldizsár. In all our products, we aim at providing high quality coupled with affordable price which we try to achieve through being cost efficient due to our family size and through direct contact with our customers. The market shows its gratitude to us for our attention, our perseverance and our affection felt for the fruit as our products increasingly more popular within the consumers who prefer having exclusive qualitiy wines and premium fruit juices. Four-five stars hotels, cafes, embassies, famous restaurants and private persons are amongs our customers. The considerable part of our products are exported to the world's different parts to market players who are dealing with specialities.